Happy Monday! If you follow me on Instagram - you might have already seen this look. I love the florals in anticipation of spring - and the mix of the cardigan for winter. And, how fun is the "star" bag. This cute fringe tweed pocket dress. This bell sleeve peplum blouse. This two in one floral stripe sweatshirt. 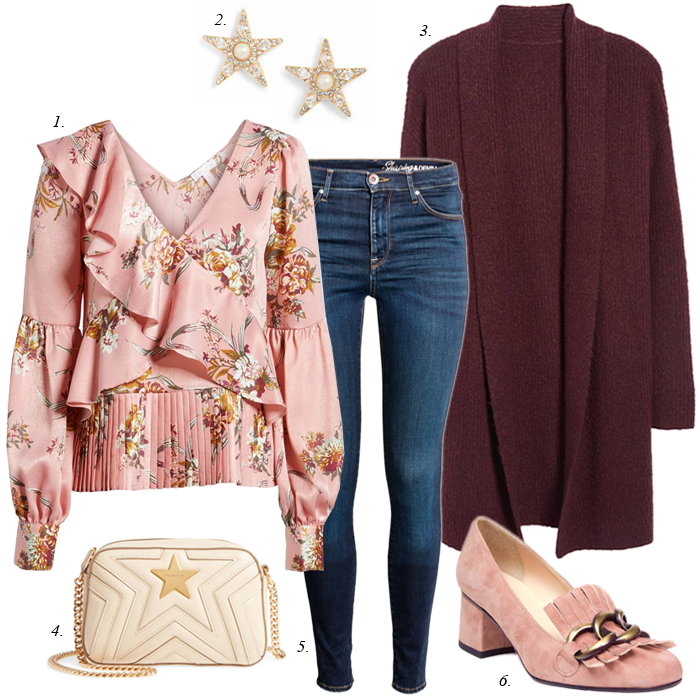 This fun ruffle bell sleeve blouse. This cute one piece ruffle swimsuit. This sweater with a fun floral back. This fuzzy sweater in a pretty blush pink. This peony pleated blouse - I love the colors. I shared more finds and popular items HERE. I tried on end of season winter sales HERE. LOFT sale try on sessions HERE and HERE. I love that floral blouse and those loafers! So pretty! I love this colour combo, Lisa! Great colour picking! Oh Lisa, I REALLY LOVE this outfit! Floral Fabulous! PS, I just clicked and ordered that blouse! I can totally see you wearing that floral top - you will look great in it. That blouse is incredibly beautiful!! I'm loving that floral top, need it!! I need that top in my life!! Love these pieces and color palette. I did a little window shopping this weekend and am loving the colors for spring. Thanks for more inspiration! Ha! Just clicked the link and realized the top isn't Loft!! We don't have a Nordstrom where I can try it on. Hmmm. Do it get it anyway?? So cute.